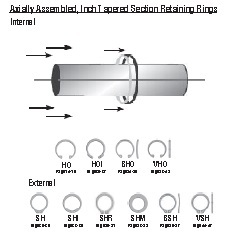 TAPERED SECTION INTERNAL RETAINING RINGS-AXIALLY ASSEMBLED | Cal Fasteners, Inc.
Axial retaining rings are designed for axial installation into machined grooves. These rings are either internal for installation in housings and bores, or external for assembly on shafts. Once installed, they provide a protrusion or “shoulder” for retaining parts.